SCVHistory.com LW2989 | 1962 Placerita Fire | Man Flees from Placerita Canyon Fire, 8-28-1962. 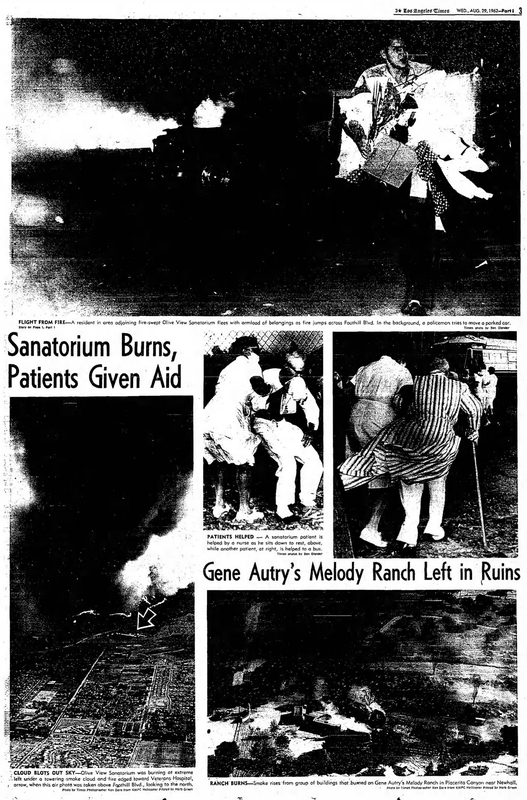 August 28, 1962 — Near Olive View Sanitarium in Sylmar, a man flees from a fast-moving fire that started earlier in the day at Circle J Ranch and blew through Placerita Canyon, taking out Gene Autry's Western town at Melody Ranch before dropping down into northeastern San Fernando Valley. Photograph by Los Angeles Times staff photographer Ben Olender (1926-1998), whose name and title are stamped on the back of this 11x14-inch print. 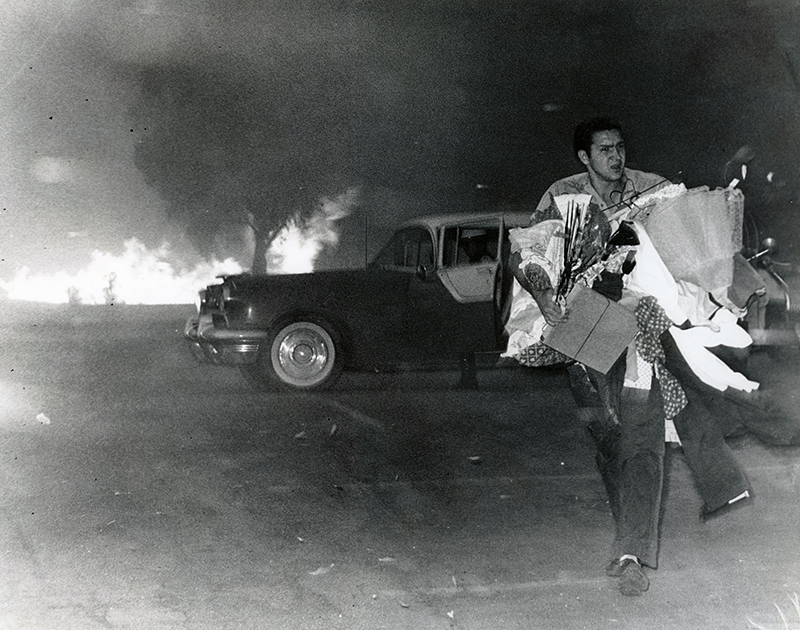 Shows resident with only belongings in 1962 Placerita Canyon fire. FLIGHT FROM FIRE — A resident in area adjoining fire-swept Olive View Sanitarium flees with an armload of belongings as fire jumps across Foothill Blvd. In the background, a policeman tries to move a parked car. [L.A. Times, July 14, 1998] — Ben Olender, award-winning Times photographer for three decades who specialized and delighted in recording sports events, has died. He was 72. Olender, who shot for The Times from 1958 until 1986, died Thursday at his home in Palm Springs, his family said. In February, the versatile photographer received a lifetime achievement award from the Press Photographers Assn. of Greater Los Angeles. He had served three terms on the organization's board and was its president in 1970. In 1973, Olender was nominated for a Pulitzer Prize for his photograph of a Vietnam prisoner of war greeting his 9-year-old daughter upon his return to the United States and freedom. The photographer considered that image his finest work, his son, Don, said. Olender received several awards for his sports photography, including the 1968 and 1978 best sports photo award from the Greater Los Angeles Press Club and the 1970 best sports photo award from the California/Nevada Associated Press. Born June 1, 1926, in Wyandotte, Mich., Olender grew up in Syracuse, N.Y. After serving as a Marine turret gunner in the South Pacific during World War II, he bought his first camera and put it to use for the Syracuse Herald-Journal. In 1949, the Associated Press offered him a job in Los Angeles. He next spent eight years as chief photographer for the Pasadena Star-News before joining The Times. Olender is survived by his wife, Dolores "Dodie" Warren; his five children, Dave, Don, Denise, Dan and Dorothy, and eight grandchildren. Funeral services are scheduled at 10 a.m. today in Palm Springs Mortuary in Cathedral City, with burial at 2:30 p.m. in Veterans National Cemetery in Riverside. The family has asked that any memorial donations be made to the American Heart Assn. LW2989: 9600 dpi jpeg from original photograph purchased 2017 by Leon Worden.